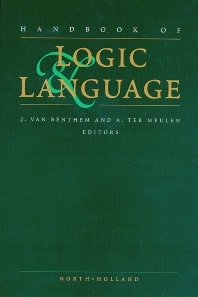 This Handbook documents the main trends in current research between logic and language, including its broader influence in computer science, linguistic theory and cognitive science. The history of the combined study of Logic and Linguistics goes back a long way, at least to the work of the scholastic philosophers in the Middle Ages. At the beginning of this century, the subject was revitalized through the pioneering efforts of Gottlob Frege, Bertrand Russell, and Polish philosophical logicians such as Kazimierz Ajdukiewicz. Around 1970, the landmark achievements of Richard Montague established a junction between state-of-the-art mathematical logic and generative linguistic theory. Over the subsequent decades, this enterprise of Montague Grammar has flourished and diversified into a number of research programs with empirical and theoretical substance. This appears to be the first Handbook to bring logic-language interface to the fore. Both aspects of the interaction between logic and language are demonstrated in the book i.e. firstly, how logical systems are designed and modified in response to linguistic needs and secondly, how mathematical theory arises in this process and how it affects subsequent linguistic theory. The Handbook presents concise, impartial accounts of the topics covered. Where possible, an author and a commentator have cooperated to ensure the proper breadth and technical content of the papers. The Handbook is self-contained, and individual articles are of the highest quality. Preface. Abbreviations of Journal Titles. List of Contributors. Part 1. Frameworks. Introduction. Montague Grammar (B.H. Partee, H.L.W. Hendriks). Categorial type logics (M. Moortgat). Representing discourse in context (J. van Eijck, H. Kamp). Situation theory (J. Seligman, L.S. Moss). GB theory: an introduction (J. Higginbotham). Game–theoretical semantics (J. Hintikka, G. Sandu). Part 2. General Topics. Introduction. Compositionality (T.M.V. Janssen with an appendix by B.H. Partee). Feature logics (W.C. Rounds). Types (R. Turner). Dynamics (R. Muskens et al.). Partiality (J.E. Fenstad). Mathematical linguistics and proof theory (W. Buszkowski). Formal learning theory (D. Osherson et al.). Nonmonotonicity in linguistics (R.H. Thomason). Part 3. Descriptive Topics. Introduction. Generalized quantifiers in linguistics and logic (E.L. Keenan, D. Westerståhl). Temporality (M. Steedman). Presupposition (D.I. Beaver). Plurals and collectivity (J.T. Lønning). Questions (J. Groenendijk, M. Stokhof). Generics and defaults (F.J. Pelletier, N. Asher). Glossary. Author Index. Subject Index. Alice ter Meulen is Professor of Philosophy and of Linguistics at Indiana University, Bloomington. Her research interest is in the interface of logic, language and metaphysics, and has been concerned with mass and amount terms in Montague grammar, and the semantics of tense and aspect in a dynamic system and its interaction with pronominal reference. @from:J. Peregrin @qu:...This handbook is an extremely successful attempt at a state of the art summary of the interdisciplinary field which centers around the intersection of logic and linguistics.